Marty wandered off from a gated yard. 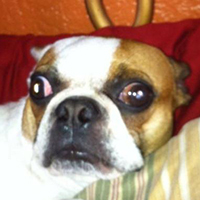 Our 12 pound Boston Terrier Marty (Feldman) wandered out of the back gate which the wind had blown open…gone! We drove around calling him to no avail. We prayed. He had his HomeAgain tag on but little did we know the microchip number had worn off. We get a call at midnight. A far away neighbor had found him wandering the streets. Now get this, she’s a retired veterinarian, she can’t read the microchip number, goes to the garage to get a leash and there is her scanner she hadn’t seen in years. Coincidence? I don’t think so! She scans the microchip, contacts HomeAgain and we have our pet back!